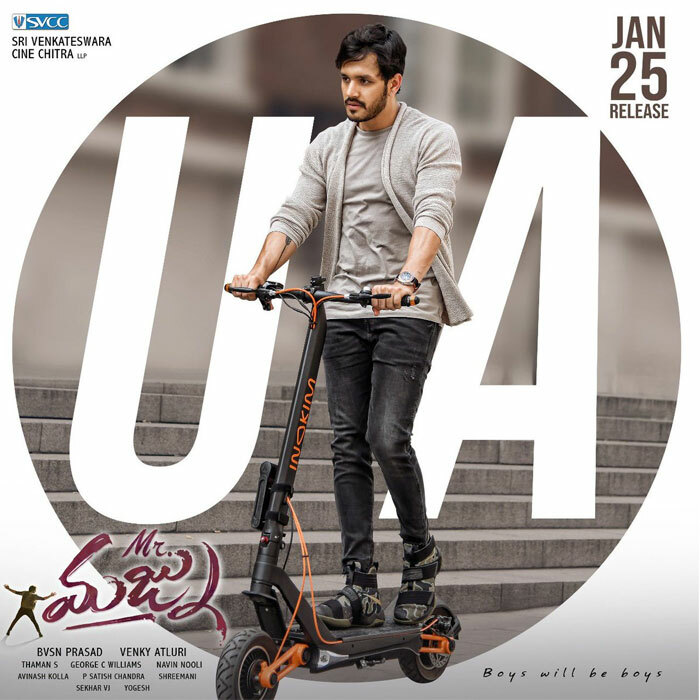 Akkineni descendent Akhil starrer Mr Majnu has cleared censor formalities and has been issued U/A certificate by board's officials with no single cut being suggested. The film is learnt to be a complete romantic entertainer with a good emotional connect thus all set to deliver first blockbuster for Akhil. Now that the songs have already proved chatbusters and so would be the picturization as hoped by the Fans who are eagerly waiting for film's release. Thaman has provided film's music. Nidhi Agarwal sported Akhil's romantic interest. Venky Atluri, who scored a super hit Tholiprema recently, directed the film on Sri Venkateswara Cine Chitra owned by BVSN Prasad. The movie is slated for release on January 25. Looks like the combination of Akhil and Venky will continue the success momentum of Sankranti hit F2.